I’m glad to announce I’ve been invited to join forces with the amazing group of photographers who contribute to Origami Collective. 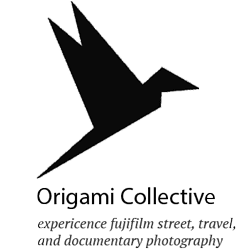 For those of you who don’t know it already, Origami is a Collective founded by Jorge Ledesma focused on Street, Travel, and Documentary photography. Its composed of various Official Fujifilm X Photographers and other Fuji X users from the globe. Feel free to visit the site at http://www.origamicollective.com, my profile page, and peruse the essays that have been published so far. Expect my first one pretty soon. I’m both proud and humbled I was invited. Thanks to Jorge and the rest of the collective for thinking of me. Couldn't ask for a better company to share with you all my stories. Looking forward seeing what comes out of this.